Berthed alongside the laid-up container ship MAERSK MAINE in the Great Harbour at Greenock, the small coastal tanker KEEWHIT was seen while delivering bunkers to the larger vessel. 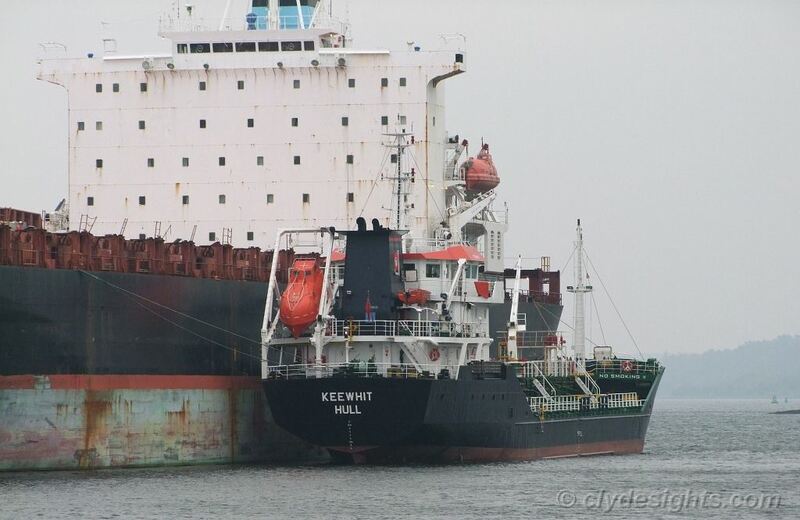 KEEWHIT is owned by John H Whitaker Ltd, and has been a member of their fleet since they acquired her in 2004 when she was a year old, having previously sailed as the Turkish RECEP MERCAN. Built by Aykin at Tuzla in Turkey, she was later converted to meet the stringent regulations required nowadays, and duly upgraded to become a modern double-hulled tanker with a deadweight of 2,130 tonnes.